is one of the most respected brands when it comes to long lasting high power batteries. Currently, BatteryPete is offering numerous savings on the whole line of ODYSSEY® batteries to help you gear up for summer. Whether you need one for your car or truck, your motorcycle or your boat. BatteryPete has you covered with these three series of batteries—Extreme Series, Performance Series and Marine Series. ODYSSEY® offers a limited 2-year full replacement warranty for batteries. When Enersys thinks batteries they think cost of ownership for the customer which is why these batteries are designed and built to give you an expected service life 3 to 10 years depending on usage. Furthermore, longer cycle life and shelf life, as well as faster recharging features, are built with these incredible batteries. All of the batteries in this line up are maintenance-free batteries and are classified by the US Department of Transportation as non-spillable AGM Deep Cycle Battery for added safety. EnerSys Energy Products Inc. is the proud manufacturer of Odyssey AGM Batteries. EnerSys is currently the global leader for various portable power solutions in industries such as industrial, military and automotive. Sales and service locations are available in various countries all over the world with some locations having more than 100 years of service in the battery industry. Manufacturing facilities are located in 17 countries. The ODYSSEY® Extreme battery is currently being manufactured in two facilities—Warrensburg, Missouri USA and Newport, Wales United Kingdom with each product built with the highest quality materials and standards. Watch this video of how the Extreme battery is made. ODYSSEY® offers a line of Extreme Series Batteries which can produce twice the power of conventional batteries and service life that is 3 to 10 times as much depending on applications. While other batteries can only have one or the other features like deep cycling abilities and reserve power or brute cranking power. The Odyssey Extreme Series Battery does it all. 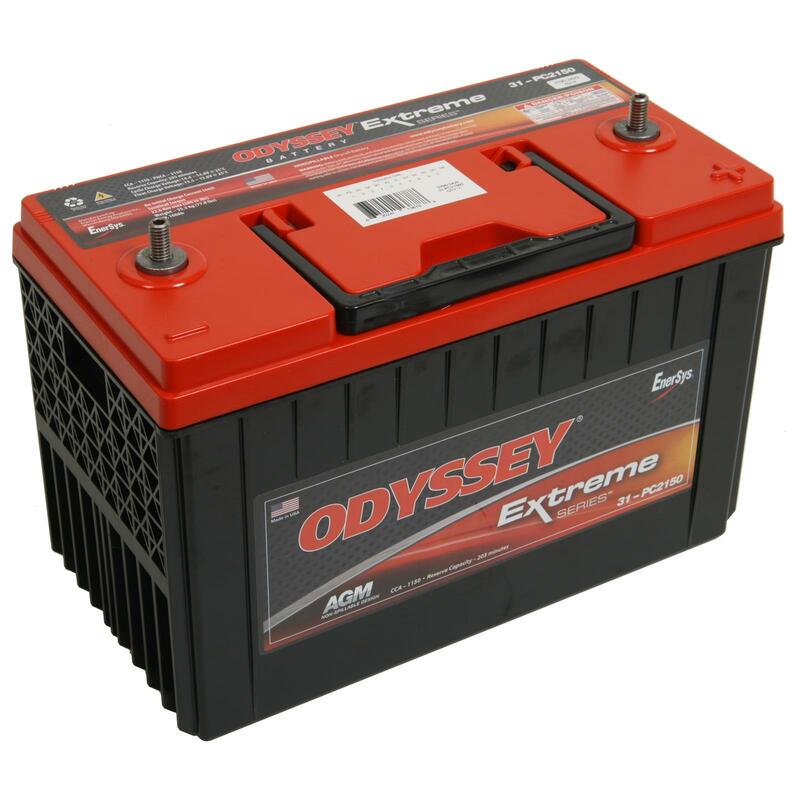 This Odyssey AGM deep cycle battery is built around TTPL technology and are made of 99% pure lead compared to usual lead of other batteries. Since these are thinner plates, more of them can fit in one battery. More lead and pure lead equals more ability for the chemical reaction to take place that products electricity. The Performance Series Batteries of ODYSSEY® are powered by 99% pure lead as well. Perfect for commercial trucks or other vehicles. The Performance Series Batteries promise high reliability, deep cycle abilities and long service life. These have the same level of reliability that the Extreme Series Batteries can offer without the reserve capacity or cold cranking amps. Do you own a motorcycle or Jet Ski? Do you ride them every day? Of course not. But when the weather is nice and you want to go for a ride you want it to start, right? The Powersports battery from Odyssey,in part numbers like the PC545, PC625, PC680, PC925, will cover all the battery sizes for any year Harley –Davidson, and almost every other manufacture of motorcycle. The PC925 Battery is the all time champion for any late model sit down jet-ski / waverunner / Seadoo.. Reliable power that you can leave for months and when you are ready for some fun in the sun it will fire your toy right up. Having a discharged battery when in the middle of a body of water whether you’re at sea or in a lake could be a hassle. The Marine Batteries of ODYSSEY® is a reliable choice for boat owners as it is greatly capable in deep cycling and great starting power as well. BatteryPete offers accessories that are specifically designed for Odyssey batteries such as the all-aluminum one piece Hold down for the popular PC680 and PC545 battery. With a sleek design yet built for the rugged outdoors. Terminal Adaptor Kits are also readily available when you need to convert your battery from a SAE terminal to a stud application for ease of installation or when space is limited. In the last quarter of 2015, ODYSSEY® will be introducing a completely new line of Battery Chargers. So look for the All New Battery Charger line to be available soon.